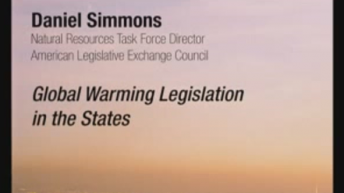 Daniel R. Simmons is director of the Natural Resources Task Force at the American Legislative Exchange Council (ALEC). Prior to working for ALEC, Simmons worked for the Mercatus Center at George Mason University, where he was a research fellow of Mercatus’s Regulatory Studies Program. Prior to that, he served on the legislative staff for the Committee on Resources in the U.S. House of Representatives, where he handled endangered species and forestry issues. Simmons also has worked for the Competitive Enterprise Institute, specializing in urban sprawl, property rights, and public lands issues.